This is a common question at this time of year among kids, those purest of getters from our getting-crazed society. At a certain point we’re supposed to become givers, I guess, at least for one day a year, but the constant rhythm of getting that riddles the modern world reveals that we’re all still kids at heart, happy and hungry to get. Me, I got a lot of good and useful stuff from the kind givers in my life, but the gift that may have given me the most pleasure is the stack of baseball cards that my wife’s aunt gave me. She was in a store that had several cellophane-wrapped stacks, and she bought the one that had a Red Sox player on top (some guy from the strike-fouled years of 1994 and 1995 that I actually don’t remember: Carlos Rodriguez). In the stack were cards from 1987, 1990, and 1995, plus a couple basketball cards and several football cards. My obsession with my distant personal past has prompted me to be somewhat rigid in my unsaid policy that my baseball card collection is closed, that I’m not making any additions beyond the cards that came to me when I was a child. But if there’s one lesson I can learn from the year that’s about to end, it’s that it’s good to be open to new gifts. Cards keep coming to me, either half-buried in the mud or torn up at a bus stop or from kind readers offering to fill in glaring gaps in my collection. This latest gift was no exception. The cards were all more recent than the cards I collected as a kid, but since I neither collected these newer cards when they came out nor dwelled on them constantly in my writing they seemed to come from a more distant time. Tom Brunansky? Ron Kittle? Juan Berenguer? These names all seemed to be singing to me from a farther and more mysterious remove than the now-familiar names of the more distant past. Each card in the stack gave me something–hilarity, excitement, even joy–but none sent a shiver through me like the card shown here. I’m tempted to fall into withering comparisons between those years for Todd Van Poppel and those years for me. But on this special day, the last day of the year, I want to try to limit my focus to the card-slim moment between past and future. Today’s a good day for this. Among all the baseball-card-shaped squares on the calendar, the last day of the year is the one most like a baseball card. The past is simplified to a series of lists such as the statistics and highlights on the back of a card, and the future has no more depth than a card-front photo of a figure standing tall, hands on hips, gazing sternly off into the distance. 1. I remember Carlos Rodriguez. Switch hitting shortstop came up with the Yanks. Had a batting stance similar to Kevin Maas, where it appeared as if he were sitting on a toilet. 4. 3 : Great post, Ken. “…that was the last time I had dreams about Todd Van Poppel” really sums it all up. 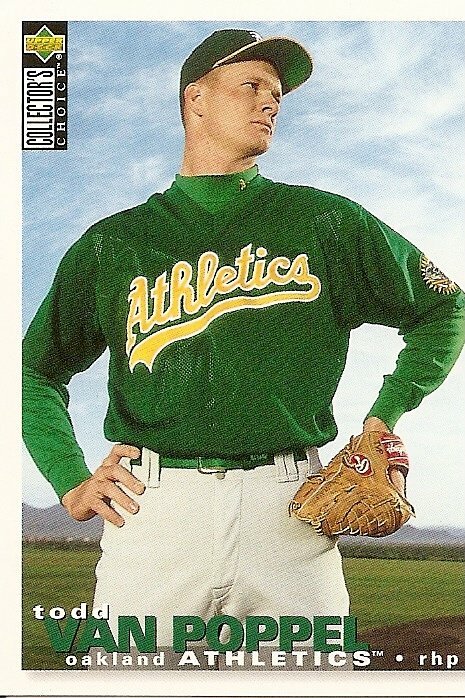 Maybe you as an A’s fan can tell me why everyone eventually stopped having dreams about Van Poppel? Bad control? No movement on the fastball? Poor hygiene? 5. 4 Fastball was hard, but straight as an arrow, no movement. Tipped his changeup. Curveball was nothing special. Add it all up and it spells “middle reliever”. For years and years before Van Poppel, the A’s organization had failed to develop any pitchers at all. The only one who came up through the A’s system during the 80s and early 90s who had any impact at all was Curt Young, and that wasn’t much of an impact. But the failure of Van Poppel directly led to the A’s success in drafting and developing pitchers since. Billy Beane, as assistant GM at the time, studied why Van Poppel failed, and a less physically imposing pitcher drafted the same year, Steve Karsay, was more successful. Beane concluded that athleticism was important towards success. Van Poppel was big, but slow and lumbering. Karsay was short and quick and catlike. The A’s drafting of Tim Hudson a few years later, as one example, is a direct result of the Van Poppel flop. These days, the A’s reproduce pitchers like rabbits. 6. And there was probably some poignant story to tell about how it was Carlton Fisk, of all people, who crushed my Todd Van Poppel dreams, but I could never quite figure out how to pull that story all together. When you write “Thirteen Ways of Looking at a Baseball Card,” be sure to include this. 11. 10 That wasn’t me, that was one of my mischievous daughters. Not that I disagree with the sentiment. Happy New Year! 12. Looking back at the boxscore of Van Poppel’s first game, probably the most unusual event was that someone (Brad Komminsk) actually pinch ran for Rickey Henderson. 13. Funny, I would have tabbed Brien Taylor as the gold standard of busts. In 2009, I’m gonna smoke everyone inside, and then I’m gonna go pound some Budweiser. 14. Nothing against your more recent work, but that David Clyde post had the type of writing that attracted me to this blog in the first place. I miss speculation on whether the minimum wage kid at the Topps factory was too stoned to operate the machinery the day a particularly offset card was printed. Van Poppel has an air of confidence on his visage the day this photo was taking [probably at ST with the Superstition Mountains in the background (Red Sox Fan from PT has changed my way of looking at cards.)] But why isn’t he looking into the camera? It’s like a young boy telling his mom a lie. He can’t look her in the eye. His potential was the lie. He had a career as good as Tanyon Sturtze’s, which is more than you can say for most kids who pitched. But it was supposed to be more. Mike Mussina was still on the board when the A’s picked him. 16. 14 : Not to imply that you were implying this, but just between you and me (and anyone else reading this), I view those David Clyde-type posts as from my pre-shark-jump days. But as the zen dudes say, when you get to the top of a mountain (or perhaps more aptly to the bottom of the ditch), keep climbing (or keep digging). What is life but what happens after you jump the shark? 15 : Ah, who doesn’t smile when pondering the saga of “The Boz”? 17. To me, New Years Eve is always a reminder of Clemente. I realize that it is before your time, in fact I was only 7 myself. But I remember hearing the news of the plane crash numerous times as we returned from a holiday visit to my grandfathers home in Vermont. The following spring I remember getting a Clemente card in one of the early packs that I bought. There was no mention of his tragic death.It was as if Topps hadn’t heard the news. His career hit total was an even 3000. For a seven year old kid, that was very eerie. 18. Brien Taylor and then Van Poppel, two absolutely can’t-miss who taught us what Rob Neyer always quotes, “There’s no such thing as a pitching prospect.” Up my way (not far north of Boston) in my time, the Van Poppel was Jeff Juden. He was about ten feet tall, threw 150 mph and struck out about 25 high school batters a game. I think he ended up being the 6th overall pick. I remember a kid who hit against him in high school gushing and gushing about how much different Juden was than even the next best kid in the league. I was prepared to watch his rise into Clemensland. Didn’t happen, of course. I think he ended up as a somewhat servicable middle-reliever for a few years, overweight and a big letdown. 19. 17 : That must have been weird seeing Clemente live on in cardboard as if nothing had happened. I guess production was too far along by January to change anything about his card (though I’m not sure what they could’ve done to the card that would have been a suitable alteration). 13 , 17 : I think of Brien Taylor’s story (his pro career ended almost before it began with a shoulder injury sustained during a barfight) as more of a tragedy than a “bust.” In my mind, a true bust has to have no apparent handicaps or roadblocks thrown in his path on his way to disappointing mediocrity. 20. I remember Van Poppel coming back home to pitch for the Texas Rangers in 2002 (his glory days came at Arlington Martin HS). Despite his 5.45 ERA in 72 2/3 innings as a middle reliever, I always considered his stint that year for the Rangers to be successful. Probably because any ERA below 6 is a success for a Ranger pitcher. 22. 21 Wow! You saw Jim Bruske’s debut game? 23. I like the pose on this card; it seems overly serious, like something you’d see 50 feet high in some Communist public square. 24. In the Van Poppel’s Democratic Republic of Berkeley, no doubt. 25. Everybody knew Van Poppel was going to be great, but he said he was going to college. The A’s only took him because, in addition to having the most talented MLB team, they had seven picks in the first two round and could afford to waste one. The Braves, with no MLB talent, passed on Van Poppel with the #1 pick, and settled for high school shortstop Larry Jones. 26. Yo, Peanut. Larry Jones? You do know that HS SS is Chipper Jones right?